We've been seeing Apple's next iOS 9 edition, codenamed Monarch, pop up here and there, indicating that the team from Cupertino is hard at work ironing out the eventual new features and stability improvements, like with all annual iOS editions, for a release some time around the WWDC conference in June. A recent major tip about what would iOS 9 stand for, hinted that it won't be as much the new features, which are usually the focus, but rather speed, optimization and stability this time. Apple made major changes to iOS an edition ago, completely redrawing the interface, and adding features galore, after all. While iPhone and iPad users largely welcomed the changes, some balked that Apple is losing the edge in the smooth and fluid operation of its mobile OS that it is famous for. 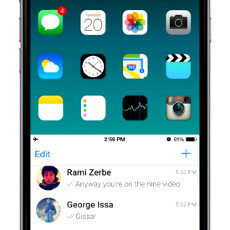 Despite that we might not be seeing major fresh features brought on by iOS 9, one can still dream, right? And dreamy is this part two of Ralph Theodory's iOS 9 concept video series that just went out, depicting wishful features galore, and displaying them in a beautiful footage. Check it out below, and tell us what is your own wishlist for iOS 9. Those who want Android like features in their iPhone. With jailbreak you can get much much more features than even on rooted Android. Ofc you don't get access to kernel but you can change everything without flashing and bricking device. And you got all tweaks working on all devices and in one store, something that Android with Xposed can only dream about. actually Android "features" were already there on iOS jailbreak tweaks long before it was on Android. I use the iphone for the iPhone. If I wanted Android features I'd go back to Android. They should rename the project to #seventeen, because it will take them another #nine years to add those features, not to forget that the iPhone 6's hardware is struggling to deliver with the addition of latest features "borrowed" from Android ICS. Exactly what features are you talking about? there's some good ideas here. Maybe Apple should talk this guy. they wont. cz Apple never release all features in a single OS Update. They will take years to do so. What is possibly a good idea here, besides multi-window? Yup, and another Android feature stolen. Of course, Apple will probably patent is a s well before as they did with the edge buttons just now. All these wishes for things Android already offers. But due to some blind loyalty, they stick with what doesn't really work for them, just to be accepted. I like certain brands too and have stuck with them for years, as long as they provide what I need and want. The minute they don't, I move on to whom does. Loyalty is one thing, blind loyalty is another. To stick with a company who for 5 years refused to make larger phones , just because is stupid. To stick with a company who watches other features on other phones reach critical mass and sell for less than a limited one, is again lame and sad. If you really want those type of things than switch. Sure, Android sometimes gives way to much. But that is the benefit of being open. We don't really have to ask, because it is given. If you have ask for 1080p or 1440p, or 16MP cameras of frnt facing cameras that can shoot 1080p like everyone else, if you have to ask for more RAM, as for more features that are "standard" with everyone else, and yet they sell their limited crap at premium prices, then its your own fault. Stop asking. Tell them you won't buy their crap, by basically not buying it. I assure you if you don't buy it, they will do better. But if you ask and don't even receive, yet you keep on buying it anyways, then they see it as well we can get away with not giving it to them because they keep buying it like a bunch of dumb robots. I agree with most of this, however, I feel the RAM part isn't necessary. Benchmarks show that even with 1GB of RAM- iPhones kept up/ surpassed the competition of 2/3GB Phones. Same thing with camera- nobody is complaining about an 8MP camera that takes better photos than most 13/16MP Android cameras. LG G3, nope. S5, nope, HTC One, nope. You're very naive to think the iPhone takes better pictures than the s5. I'm tying from a 6 plus if you care to know. I have a friend who owns the s5, pictured from my phone don't even come close. You listen to biased reviews and forget to go out there to compare for yourself. I'm jumping ships when the s6 edge launches. You're smart unlike JeffPilsner who doesn't ujderstand that the reason iOs works with 1GB is because it has lousy and very limited multitasking. You simply can't have apps running that fill up more than your 1GB. The one time I can take you seriously; when you're not trolling Samsung/Android topics, that is.